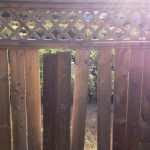 When is the right time for a new fence? If you are looking for a new fence we will help make your decision easy. Do you want a fence that is easy to maintain and one that will look stunning for years to come? Here is the secret, insist on a new vinyl fence. Vinyl fences have become the popular choice for many people replacing their old fence or those installing one for the first time. There are many different fence styles, colours and accessories to choose from. The beauty about a quality vinyl fence is that it’s low maintenance and will last a lifetime. I have heard numerous stories about the cost and time to maintain a wood fence. If you do not believe me, ask my father-in-law. He repainted his wood fence about five years ago and spent many days and dollars to make it look respectable. He now vows “NEVER AGAIN” and plans on removing the old fence and replacing it with a new premium vinyl fence. Myself, like most people, want something that is going to last a lifetime. Who wants to spend money and time to maintaining a wood fence? In the upcoming blogs, we will offer advice on choosing the right fencing product with tips on care and maintenance. It is important to ask the right questions when investing and caring for a new fencing product. If you have any questions feel free to email or give me a call.